Stomping, growling, gnashing, and twitching! And that is just from the adult patrons in the public library!! Ha! just kidding. But seriously, is there anything better than monsters? 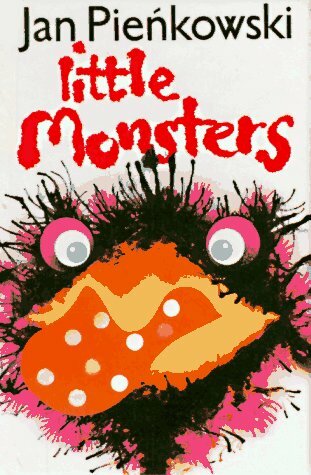 Little guys love monsters. Maybe it is the idea of being a little bit scared, or of overcoming/controlling something much bigger than they are. Or maybe they just like pretending to be the bigger stompier thing that gets to be (relatively) loud in the library. 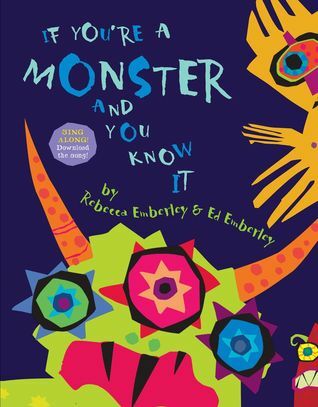 Whatever the reason – your little monsters are sure to love a monster theme. So, let’s get stompin’! But don’t be scared away! And they just want to play! I have a version of this in a collection of Mayer called There’s Something There! Three Bedtime Classics. This first tale is very empowering for Preschoolers since the heroine goes on an adventure to capture the monster herself. She succeeds but he slips away before her parents can get out of bed. She is not deterred and makes a plan to try again tomorrow. 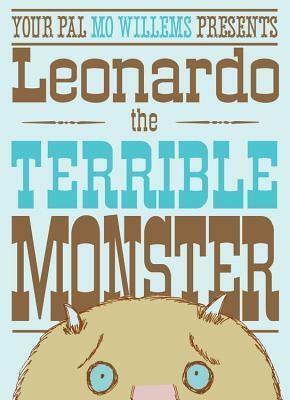 The monster is completely cute (if not gigantic) and is a lover of toys. Her toys specifically. I get the impression that he is a large toddler. I read this to both Toddler and Preschool crowds. 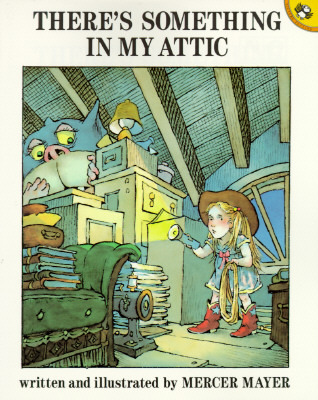 Everyone seems to get a kick out of her red cowboy books. Ah, Texas. This is a very short pop-up book with only 5 monsters. The pop-ups are both clever and a little gross so the kids and parents enjoy them. A terrific space-filler-program-move-along-er. I read this to Preschoolers for the play on words, the age of Sam, and the laughs on the bird poop reference. Awesome. While the bright bold illustrations pop off the dark background up close, I find them harder to read across a crowd in storytime. Of course this title lends itself perfectly to standing up and singing it loud! The kids will have so much fun – it’s as if they are illustrating the book with themselves. For Toddlers, I generally abridge the song slightly due to attention span. Claws, feet, roar and tail are usually the biggest crowd pleasers. Be prepared for lots of noise from your little monsters. Emberley proves his genius once again with colorful cutouts on black pages with simple descriptive text. Together we build a monster and then declare our bravery and dismantle that same monster piece by piece making him “Go away!” (until we want to do it all over again!) 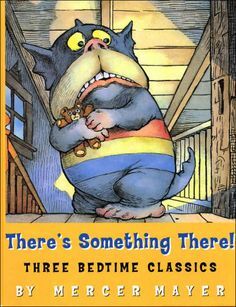 One of my favorite books to read at bedtime – it is completely clever and empowering at the same time. I use this for monsters, bedtime, and colors. See the Props section below to get a glimpse of a great puppet that tells this same story. 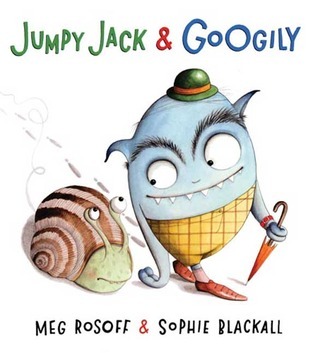 Jumpy Jack is a sweet snail that lets his imagination get away from him while he asks his friend, Googily, to check places for a monster with thin feet, two fingers on each hand, and a bowler hat. Googily is supportive and reassuring while checking behind trees and through mail slots. I read this to the Preschool crowd due to length and also because they are just beginning to catch on to clever plot lines like this one. They will laugh at the twist ending, too. This one is a hit every time. The story is just silly/gross enough and the pictures are fantastic. 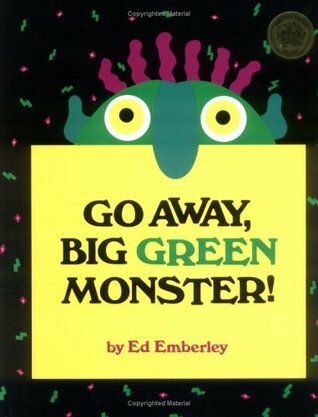 I read this to Preschool and up for the creep potential and the loss of limbs. The book itself is slightly small but my colleagues in Austin Public’s Literature LIVE! 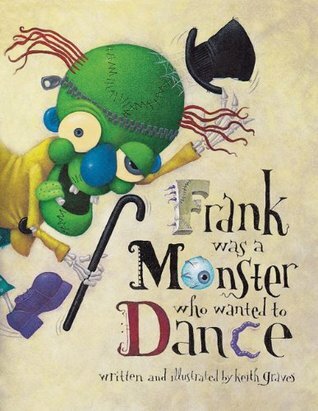 will show you how to make a Frank of your own in The Making of a Monster. That’s pretty complicated, really, so just ask the kids to scoot closer to get a good look! Pretend to be a monster! This theme is a great excuse just to get the kids up and start them moving. Have them show their claws, their terrible teeth, their long twitchy tails – and have them stomp around the room in a monster parade around their parents. Then break into If You’re a Monster and You Know It (see song below). One fell down and that left four. One slid down and that left three. One got bored and that left two. One fell asleep and that left one. Yes, there are six monsters in this picture but that is just so I can have an extra or mix up the colors once in a while. The monsters all have different expressions so we can talk about emotions and different shapes on their chests so we can talk about shapes. I don’t mention all of that stuff at once but it is nice to have some crossover for other themes. This is a great Storytelling Puppet from Lakeshore Learning. It comes with the sequence of the story on a small card you can keep on your lap – if you are afraid you might forget. The kids love it. 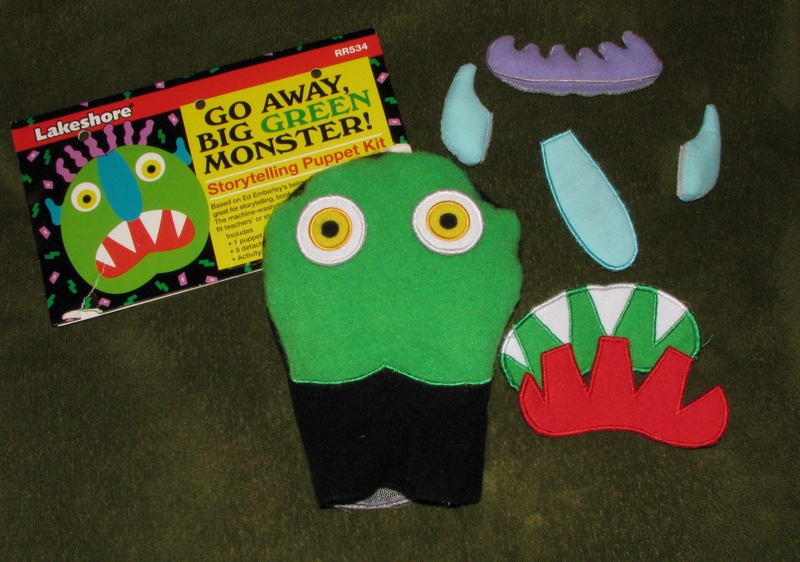 I read the book right after using this puppet. Double the fun! If you’re a monster and you know it clap your claws! 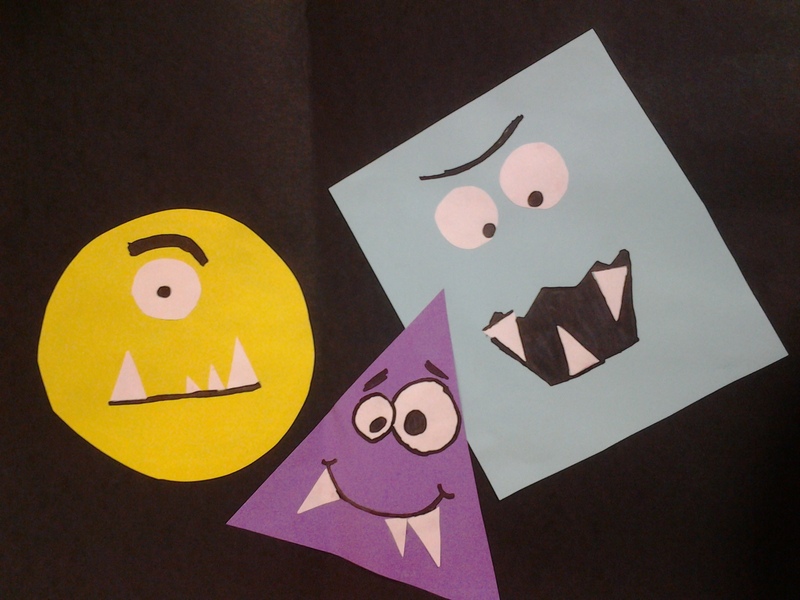 Found these cute little shape monsters at Fun Family Crafts. Each Preschooler chose a colorful piece of paper and some shapes. We had plenty of triangles, circles, and squares to choose from. I also had my summer teen volunteer (thanks, Evelyn!) cut lots and lots of smaller white circles and white triangles for eyes and teeth. 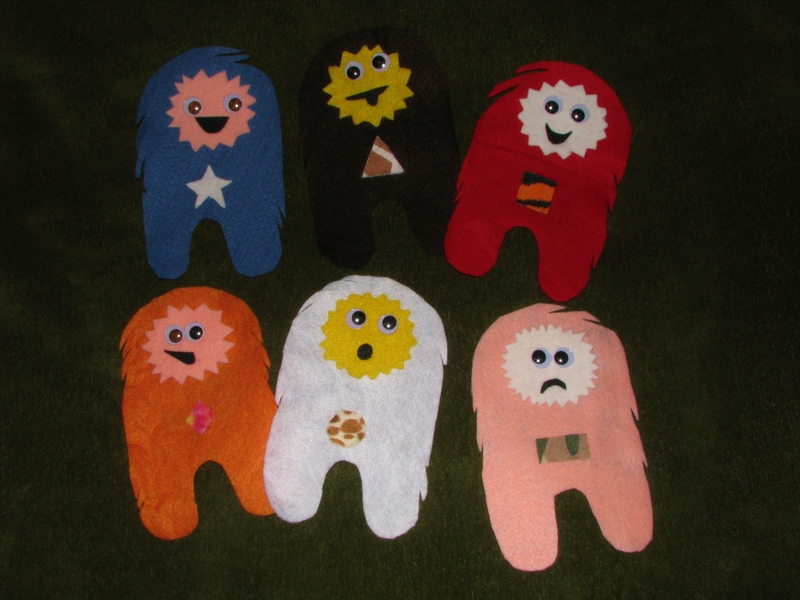 The kids loved counting how many teeth their monster had. This craft is great for color and shape recognition, glue stick skills (fine motor! ), and counting. Lots of fun and compliments from parents and monsters alike on this theme. It’s not just for Halloween season, either!